Most usb web cameras will work. I used an old Microsoft lifecam vx 5000 that I bought ten years ago. My family owns three cats; for the most part, they are well behaved - unless they are hungry. When it's time for them to eat, they get a little crazy - constantly meowing and running under/bewteen our legs, or waking us up at night. We used to keep extra food in their dishes, but they would just overeat - resulting in cat throw-up (which, without fail, I seemed to step in every morning on my way to the kitchen). We've been living in this "claw-ful" situation for a few years, and never really considered resolving the problem, until I saw the re:Invent Alexa Skill contest sponsored by Capital One and Amazon Alexa. My oldest daughter suggested that we (and by we, she really meant me) build an automated cat feeder. I told her that I didn't have the time to build one... but then, I figured, why not give it a try. The Cat Feeder is really two things - a Alexa skill that controls the device and a dry food dispenser powered by a Raspberry Pi. Commands interact with the physical Cat Feeder using AWS IoT by sending messages to the device via MQTT or getting status of the feeder via device shadow (more on this in the technical sections). Note - The above video does not show the cat joke intent (or passing the amount slot with the feed cat intent). See video below for demo. A light sensor is used to determine if more food needs to be added to the hopper. Note - For those that are looking into building Alexa skills, please read and consider. Otherwise, skip this section to get to the "how to build/replicate" the skill. No account linking: My skills typically need to save user preferences. In the past, I've used Google Auth to enable account linking - retrieving the user id to save preferences to in a DyamoDB table. Google recently changed how they allow authentication in web apps, which "broke" a few of my skills. I didn't want to live through that again, so I decided to use the Alexa user id to persist user preferences. Limited code configuration by the end user: I wanted to make configuration of the physical device as simple as possible, so I (a) build the configuration instructions into the skill and (b) limited the code changes to one variable change in two scripts. Maintain-ability - My previous skills were too difficult to maintain. The code was overly complex. For this skill, I decided to RTFM (read the freaking manual) and made better use of the functions provided by the Alexa Skills Kits SDK and Alexa IoT SDK. I also made heavy use of local development (as outlined in this tutorial by Nathan Grice. This saved me HOURS of testing time). Security - My last IoT skill was not built with security in mind. I didn't restrict policies or roles, which became a problem when others wanted to replicate my project using my Alexa skill. This time, I thought through my security before I started coding. This allowed me to restrict roles and policies so that I could share access keys and certificates without fear of allowing too much access. A Hacking/Prototype PoV - As I stated in the introduction, I wasn't originally going to build this device - as I didn't think I could get a working prototype in place by competition deadline. But, I decide to give it a go, because the time for me to build the skill (basically, over Thanksgiving weekend) was about 30-40 working hours. I wanted to prove that a working prototype could be built in this time - hopefully inspiring companies to allow their employees to invest 1-2 work weeks developing an Alexa skill for their companies. Note: this section details how I built the Alexa skill. This Alexa skill is somewhat advanced and uses multiple AWS "services" (in addition to Lambda). For those new to Alexa development, I suggest you start first with the Alexa getting started guide. If you've developed Alexa skills before, please continue. After Configuration is complete, all commands can be used. Details on all commands (and their interaction) can be found in the VUI diagrams. Interaction with the raspberry pi is through two channels. Device Shadow- a mechanism to get the state of a physical device. I use the device shadow to let me know the state of the light resistor. The code is available in my Github library. I hope to have the skill certified and available for general use in the next few weeks. The CatFeeder was build using a Zervo Dry Food Dispenser. Any dispenser can be user - you just need to be sure that it is controlled by a paddle wheel. Your servo needs to be a continuous rotation servo. This was the hardest part of the physical build. I originally built my own shaft to connect with the servo and paddle wheel. 1 / 5 • Fitting the servo in the "cradle"
Unfortunately, the shaft broke during testing, so I ended up attaching the servo to the original handle. My second challenge was stabilizing the servo. My original plan called for the the servo to be mounted in the back of the device - which would provide the support needed to turn the paddle wheel. When my first design failed, I had to move the servo to the front - where there was no support. I resolved this by making a makeshift stand to keep the servo in place. The remainder of the dowel was used to stabilize the servo. The Servo is controlled using the CatFeeder.py script (see script in GitHib library). The Alexa skill passes in (via the MQTT topic) the amount of time for the servo to run. 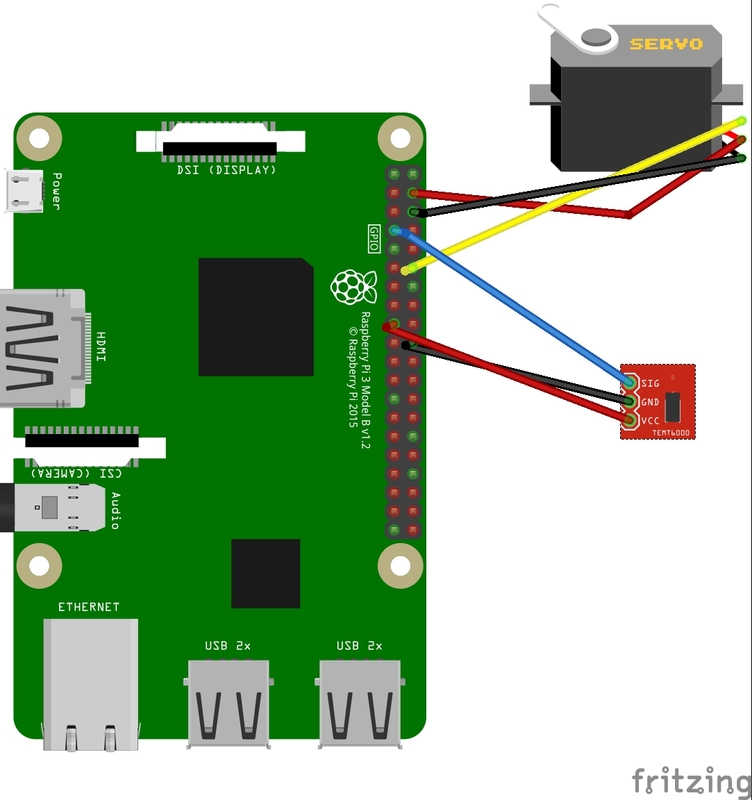 The command 'gpio -g pwm 18 200' starts the servo; 'gpio -g pwm 18 150' stops the servo. os_string = "gpio -g pwm 18 200"
os_string = "gpio -g pwm 18 150"
A standard usb webcam is used to take pictures of the cat food bowl. The Alexa skill sends a message to the MQTT topic, which triggers taking the photo and uploading it to S3. photo  = "Photos/" + photo_name + ".jpg"
I attached a light sensor at the base of the plastic hopper. When the food level in hopper is above the "base", then the sensor does not detect light (meaning that the hopper does not need food). When light is detected, then food needs to be added to the hopper. The light state (0 = light, 1 = dark) is saved to the device shadow and updated every 30 seconds. The Alexa skill queries the state to let the user know if the hopper needs to be refilled. The Cat Feeder, with all parts assembled. Since I use a light sensor to detect food level, there is a chance I would get a "false positive" depending on the lighting the room - e.g., the hopper is empty, but the feeder is in a dark room. To deal with some of that ambiguity, I ask the user to provide his/her zip code. I use a weather API from APIXU (https://www.apixu.com/ ) to determine if it is day or night. If it is night time, I caveat the "empty" statement (see the live example in the long demo above). Replace the light sensor with an ultrasonic distance sensor (I believe it will be more accurate, but I worry about getting good readings. Build a sturdier base for the servo. Build schedule functionality (to feed the cats 'x' times a day, either at a certain time, or an interval). Build Notification (via email/text) or Amazon Replenishment capabilities into the feeder when the food level is low. Use git to download the code. Your code should be in the home/pi/CatFeeder location. You should also have certificates downloaded to the home/pi/certs folder. Enable the Cat Feeder skill in the Alexa App. Ask Alexa "tell cat feeder to configure". This will trigger Alexa to send you a code in the Alexa app. Update the Update_Shadow.py and CatFeeder.py python scripts with this code (update the topic variable at the top of the script). At this point, your the skill should communicate with the Raspberry Pi.